Each believer takes personal communion or as a family daily April 12th – April 19th. Today, let’s ask the Lord for this nation of America as our inheritance. We say Spring up! Oh well! Let living water and salvation pour out upon the United States of America. His love will never fail us! His promises are true. His Righteousness will complete its work in us and our land! 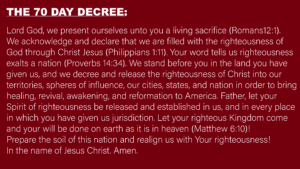 Decree the Scriptures and word over our nation, the State of Arizona. Decree the Preamble of the State of Arizona: We the people of the State of Arizona, grateful to Almighty God for our liberties, do ordain this Constitution. “Arizona is the Brightest state with the most glory. The Lord said, watch Me raise Arizona up as a prototype of what I am bringing in the days ahead. Arizona will carry the torch. It is amazing what God is doing in Arizona. The Lord has chosen Arizona for a new move of His Spirit to sweep across the land. Arizona is a new wineskin for wine to be poured out. Something is going on in Tucson, and the grapes are beginning to ripen! God’s people are ready to be poured out. Arizona is the state God is looking at – right now – to bring a spiritual inheritance for the nations.” God says, “What I have begun, I do plan to finish.” The blossoming of the almond tree here is connected to the olive tree. It takes 9 months to produce fruit. You are entering a nine-year season of anointing – harvest. This state and land will experience My glory in a new way. This womb will be healed within you to bring forth this move. It is coming – healing-mantle coming forth in this state that will affect the nation! Full circle! Fire is Coming! The glory of God reigns as He uncovers the enemy. A glory move is coming to this region. Arizona is first in activation of new glory realm! Father, as we are coming to the end of the 70 Day Decree, we acknowledge that Arizona is the tipping point state. Let the prayer bowls of Arizona be tipped now in such a way that it causes such a heavenly commotion that other bowls are tipped. Let the chain reaction began! Lord, thank you for Your ekklesia rising up in the State of Arizona. The Lord has given you authority to ask for the nation and the nations. Your day of delivery is upon you Arizona. What you have been carrying in your DNA will now be birthed. What you have incubated will now be revealed. No more delay, Arizona, this is your day! In Jesus Name, Amen!